Avalon Grille serves premium meats, local fish, and farmstand produce, artfully crafted into a menu of chef-inspired dishes for a unique dining experience only steps from Avalon Bay. The spectacular central bar, which serves world-class wines, micro-brews and signature cocktails, provides a focal point to Avalon Grille’s distinctive ambiance. Warm wood accents, high ceilings, spacious patio and a large window wall, which opens to spectacular harbor views, further enhance the unique character of this popular Catalina Island dining establishment. 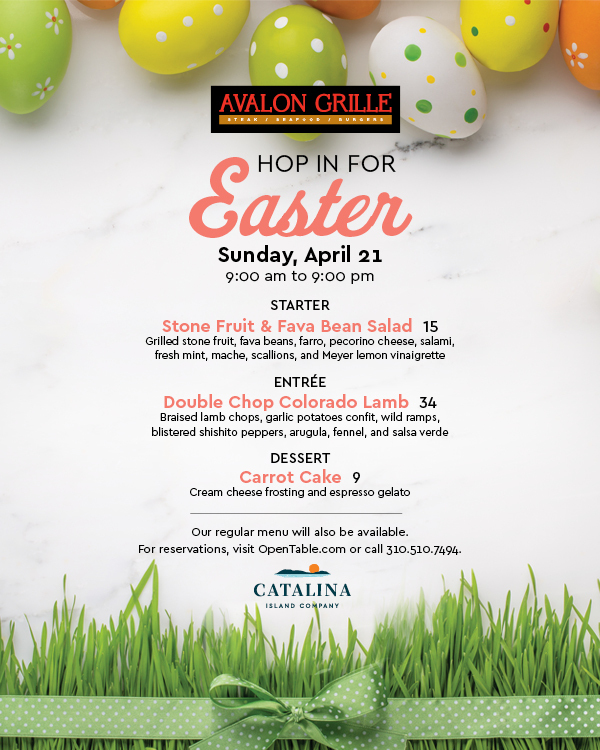 Avalon Grille is located on the corner of Crescent and Catalina Avenues, across from the beach and Green Pleasure Pier in the heart of Avalon. For hours and reservations, call 310.510.7494 or visit OpenTable.com. Created by Philip K. Wrigley, the Wrigley Martini was revered for its extra kick by newsmen, ad execs and sports figures in 1950s Chicago. Originally served only at The Wrigley Bar in Chicago’s landmark Wrigley Building, this classic Windy City libation is now available exclusively at Avalon Grille and Descanso Beach Club. Dinner open until 9:00 pm on Sunday to Thursday and 10:00 pm Friday and Saturday.